The Garage provides customers of StaxUP Storage in Homeland California with RV repair and maintenance services. Can you think of one self storage facility that offers on-site automotive detailing alongside a family owned cafe? No? Alex Martinez is aiming to change that. Alex began working as a mobile automotive repair and detailing professional in 1998. He focused on minor boat and motorhome repairs including painting, fiberglass, plumbing, and electrical repairs. His mobile business became stationary when one of Alex’s clients told him about a vacant car wash located on the premise of StaxUp Storage in Homeland, California. Alex spoke with the facility owner and asked if the space was available to rent — and it was. “That’s when it came together,” Alex said. While the car wash facility gave Alex the opportunity to have a physical location and offer clients other services, Alex saw yet another opportunity. “When I rented the space, we decided to do the carwash and a cafe, while doing minor repairs on the back of everything,“ he said. With the help of his wife and daughter, the addition of the cafe became a reality. “It was a funny idea because my daughter studied culinary and modern bakery and so all the food was fresh from scratch,” he said. The quality of the food was praised by Alisha Carey, Facility Manager at StaxUP Storage in Homeland, CA, who said the cafe offered crepes and bagels in the morning, then paninis, salads, and cold sandwiches later on. StaxUP Storage in Homeland, California features an RV sized car wash! While Alisha was impressed by the food, she also raved about the care that the family took to update the look and feel of the cafe. “It originally started as an Italian type bistro, where they had the grapes and the fruits and the wineglass pictures on the wall with the bottles of wine. And now, being that it is the carwash area, they turned it into a garage,” Alisha said. She went on to describe how the cafe has custom tables made out of old oil barrels and drums, alongside custom chairs to match. The light fixtures were fashioned from old license plates, and vintage decals and signs adorn the walls. To drive home the garage theme, the cafe was re-named: The Garage Detail Center and Cafe. We wondered though–how did patrons of the storage facility, and the general public receive the fledgling cafe-car wash-automotive-detailing combo? Alex admitted that getting new customers through the door has not always been easy. Though with 50-80%(depending on the time of year) of the tenants storing their RVs at StaxUP employing Alex to care for their vehicles, business has been steady. 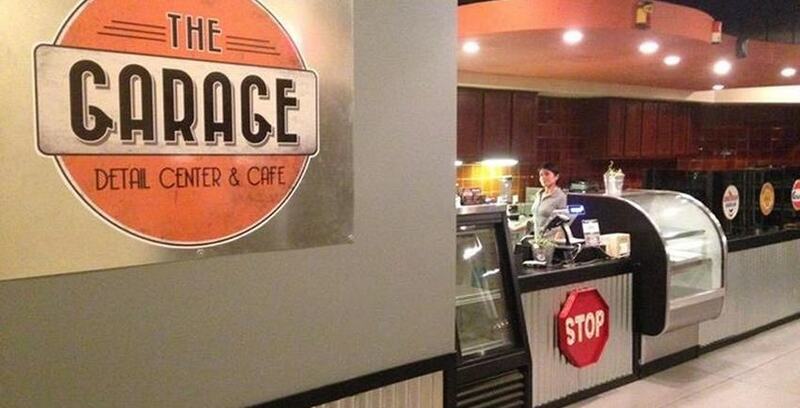 Alex, his wife, and daughter have refurbished the cafe using a garage theme. They have done a great job! Due to unforeseen issues, The Garage hasn’t served food for some time. Alex and his family hope to start selling food in their cafe again during the coming year and Alex is currently working to acquire the proper permits and reopen the cafe. He says they should be able to serve food at the cafe again by the summer. Until then, you can still enjoy fresh coffee and other beverages on your next visit to have your RV washed or detailed!